Sun Dial Lodge is surrounded by thousands of acres of National Forest, which have many beautiful hiking trails, including the Appalachian Trail with both extensive hiking as well as a smaller local trail, which are very close to the lodge. The Lodge offers spectacular mountain views from almost every room on both the main and the upper level with 30’ ceilings in the main room. The entire interior is constructed of beautiful yellow pine and has been tastefully decorated with the mountain theme. The oversize dining room table will seat 8 with plenty of room to spare. The Master Bedroom has a comfortable King sized bed, a TV and a screened in private porch. The large master bath has a jetted soaking tub with a separate shower. On the Loft you may wish to enjoy Billiards by the gas log fireplace. A large desk is situated on the loft for your convince. The Bedroom on the Main Floor has access to the main porch via double doors, and has a comfortable Queen sized bed, adjacent to the bedroom is the bathroom. The Lower Level Bedroom contains 2 comfortable Queen size beds, and adjacent to the bedroom is the lower bathroom. Also on the lower level you have a video room with a 50” High definition TV with DirecTV DVD and VHS. You can enjoy the expansive porch on this level with access to the 2.5 acres and out door fire pit. You will see much wild life in the area; you may spot deer from one of the porches, and sometimes turkey and an occasional black bear as well as humming birds and much more. 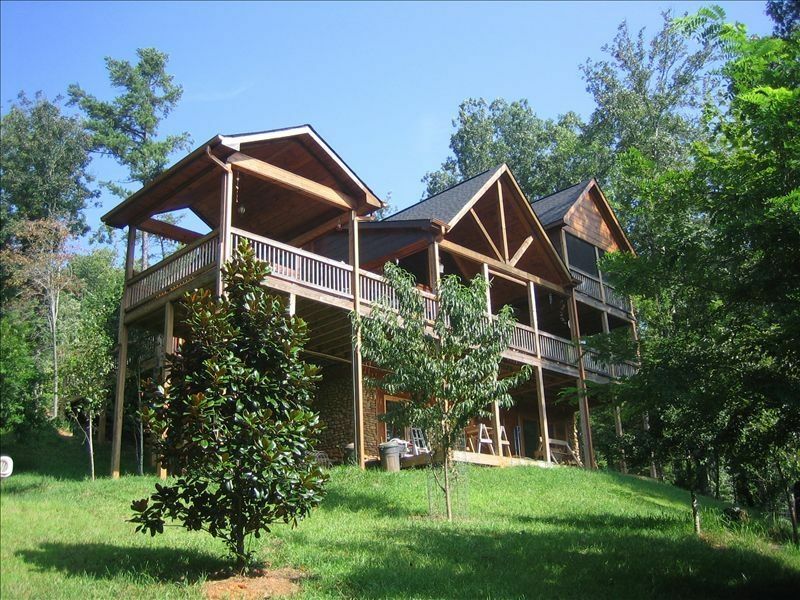 Conveniently located only 25 minutes to Blairsville, Blue Ridge and Ellijay, and about 1 hour from Murphy NC, and a choice of 2 rivers for white water rafting. Locally you will find any number of things to keep you occupied. Dial is one of the most beautiful areas of the North Georgia Mountains, with the Toccoa River near by, and beautiful pastures as well as the Mountains. You will feel as if you were a million miles from civilization and the area is extremely quiet. We purchased this property as a second home. It has been our dream to own a cabin in the mountains so our ever expanding family could get together and enjoy vacations together. When we walked in and saw the view and the beautiful great room and dining area, we knew that we had found our home. We have had some absolutely magnificent vacations here and looking forward to many more. We have seen most of the Blue Ridge area and have not found an area that we like more. We have a wonderful time exploring the trails and tubing down the Taccoa River. We hope that you will love the Sun Dial Lodge as much as we do. The location has beautiful mountain views with a pastorial feel with the goat farm at the bottom to the road to the pastures that line the Toccoa River. The Red Berry Ridge homeowners association commitment to preserving feel of the rustic mountains but also having a upscale private community, with only 15 home sites in the development you will find only more luxury homes. HBO, Show Time, Stars,& all other premium & local from DirecTV. We have a wrap around deck which has a gate to keep pets confined on the deck if needed. 6 person maxim including children. 1 week (7 days) minimum stay for Thanksgiving and Christmas. No Pets allowed.